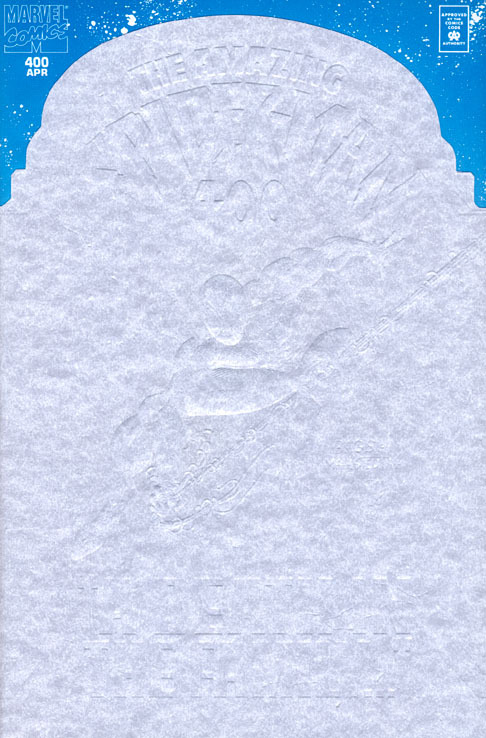 With its tombstone cutout on the cover, the front of ASM #400 echoes a far more famous issue of the series in ASM #121 – the death of Gwen Stacy. When I first laid eyes on this issue as a 13 year-old, I knew that something heart-breakingly catastrophic was imminent. Unlike the previous two centennial issues, ASM #400 was light on action and was instead an interesting character study of the man under the mask, Peter Parker (and his clone). Going back to the very first appearance of Spider-Man in Amazing Fantasy #15, his Aunt May was portrayed as both fiercely protective of her nephew and weak and frail. She had been on the verge of death so many times before, her perpetually ill state constantly hanging over the head of Spider-Man, reminding him how tenuous his personal life was. And yet she always persevered, thanks to the heroics of Spider-Man, and of course that Parker fighting spirit she referred to all the way back in ASM #18. 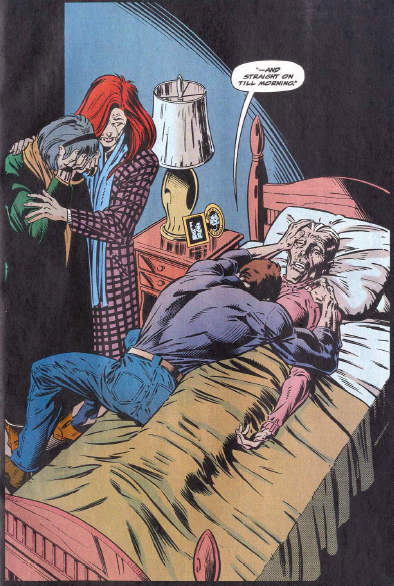 DeMatteis writes an incredibly moving story here that builds on more than 30 years of near-misses and poor health for Aunt May. 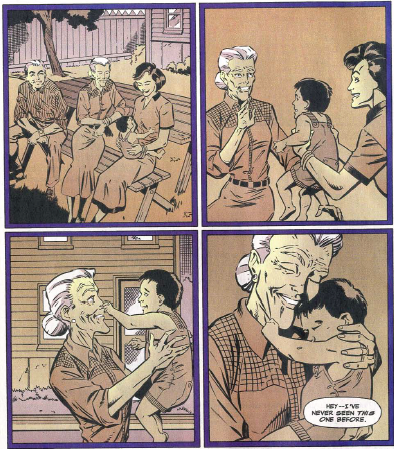 What we get is a simple but powerful premise: what would the final days of Aunt May’s life look like? She shares quality time with her nephew who puts aside the heroics for an afternoon to oblige. They share laughs and May quotes one of my favorite children stories of all-time in Peter Pan, “second to the right and straight on ‘till morning.” She reveals to Peter that she’s known that he’s Spider-Man for quite some time. He’s floored, and then, as he long-feared, she takes a turn for the worse. But it wasn’t the reveal that he was Spider-Man that caused any of this. It was just May’s time. ASM #400 is filled with so much love from DeMateis, that it’s impossible not to empathize with Peter as he sits bedside with May. 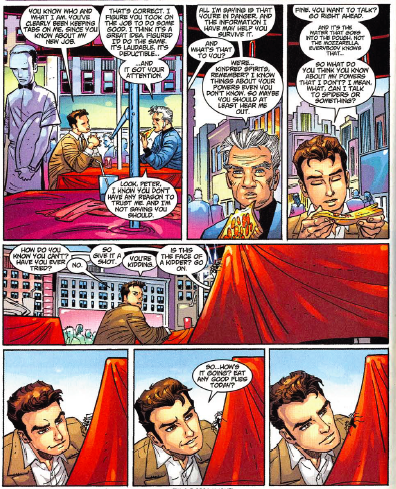 And while a crying Ben Reilly sitting outside May’s window would go on to set up the oft-reviled Clone Saga, I even felt bad for the Scarlet Spider in that moment. The events of ASM #400 would turn out to be a cruel joke from Marvel. May was revived in an absurd twist that had the recently resurrected Norman Osborn play one last “trick” on Spider-Man where he kidnapped his Aunt May and hired a body double to die. It was insanely illogical even by comic book standards. 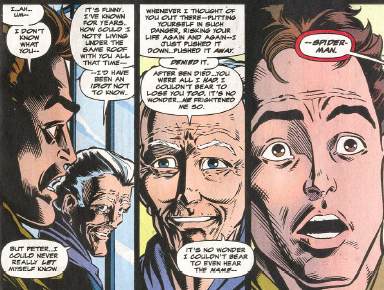 Today, Aunt May is an amorous old woman married to J. Jonah Jameson’s father. Hilarity has often ensued any time Peter is forced to picture her in the bedroom. But that doesn’t change what DeMatteis, Bagely and company accomplished in ASM #400. They wrote a legit tear-jerker, something that is damn near impossible in the cynical world of post-80s comic books. This comic contained a send-off for a beloved long-term character that felt fitting and satisfying. And for that, it long remains a favorite issue of mine. 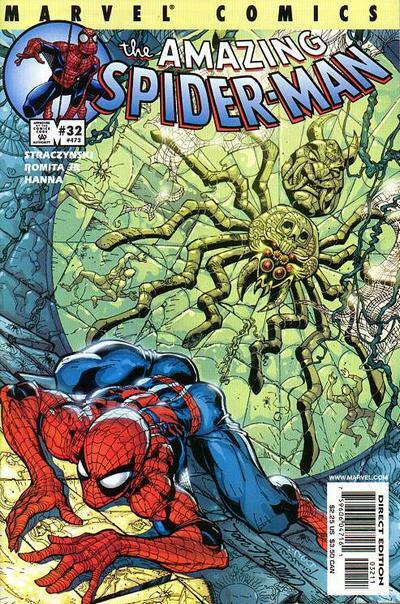 While I could have picked any of the first five issues of Straczynski’s run on ASM in the early 2000s – the Morlun/Ezekial arc is truly one of the greatest in the comic’s history – I chose to single out this issue because of its presentation of the controversial “Spider Totem” theory. There are some readers out there who saw the Spider Totem concept as gimmicky and overly intellectual, and they may have a point. But I absolutely loved what it came to represent. Here we had a writer in JMS who took the status quo and challenged it in a way that really forced readers to reconsider things they’ve taken for granted for years. For those unfamiliar, a mystical character in Ezekial comes into Peter Parker’s life and raises an interesting question – did he receive his powers from a radioactive spider, or was there something more inherent and innate inside Peter that the spider’s bite triggered. 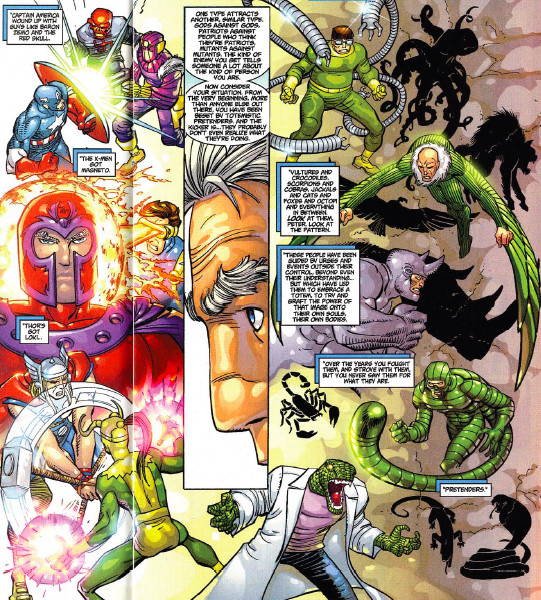 In his explanation to Peter, Ezekial looked at other characters in the Marvel universe and showed how certain like-minded heroes and villains always sought each other out, as it it had been pre-destined. Captain America, a patriot faced off against a foreign threat in the Red Skull. Thor and Loki – two Gods – did battle. Spider-Man, a character based on an arachnid, was often confronted by villains who were animalistic in nature – an octopus, a lizard, a rhino and a vulture to name a few. This sequence is quite possibly one of the most mind-blowing things I’ve ever read in a comic book – both shockingly simple in concept but also incredibly complex and fun to think about. The passage gives total credence to the idea that Doctor Octopus – a scientist with eight appendages – is the true villainous equal to Spider-Man, something I’m sure Slott considered when he penned ASM #700. One More Day/Brand New Day went on to undo some of the hypothetical babble that JMS specialized in, but that doesn’t change the fact that for a short period, some truly unique thoughts could be found littered throughout the pages of Marvel’s flagship title. And oh, by the way, on the last page of this issue, we get a truly terrifying panel of a brand new supervillains name Morlun who might be the most exciting adversary introduced in ASM since Venom was sprung forth in ASM #300. Not too shabby. It’s so nice to see someone give that story its due. I wasn’t consistently reading ASM at the time but I picked up that issue randomly and fell in love with the idea of totemistic power. Great art too. 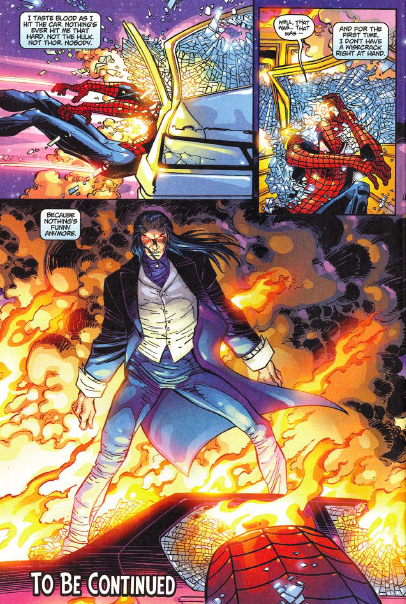 It’s a shame that Morlun’s re-appearance in The Other was so much less interesting.